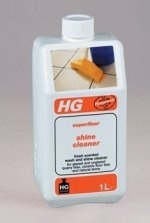 HG shine restoring tile cleaner (shine cleaner) (HG product 17) is a freshly scented, concentrated mopping cleaner with shine restorer, developed specially for regular, easy and quick cleaning of both porous and non-porous floor tiles, flagstones and non-calciferous natural stone. This product also enhances the colour and structure of the tiles. Dissolve 50 ml in half a bucket (5 l) of lukewarm water. Then clean the floor with a wrung-out mop or floor cloth, regularly rinsing it in the cleaning solution. Do not rinse or mop dry, simply leave the floor to dry on its own. 1 litre is sufficient for 20 washes, so it's very affordable too! !